The Magic Mitt That Erases Makeup WITHOUT cleanser?! When it comes to cleansing us ladies take it pretty seriously. I for one, have been cleansing for years and whilst I don't use the same face wash I bought from Boots back in the noughties, I've tried and tested a sea of cleansing products that claim to leave my skin looking flawless and feeling fresh. There are formulas for every skin type and an array of bars, pump soaps, creamy, gel and even foamy face washes. But I've found a cleansing alternative, which serves perfectly for the low-maintenance girl and for those of you who have super sensitive skin that erases makeup WITHOUT cleanser. 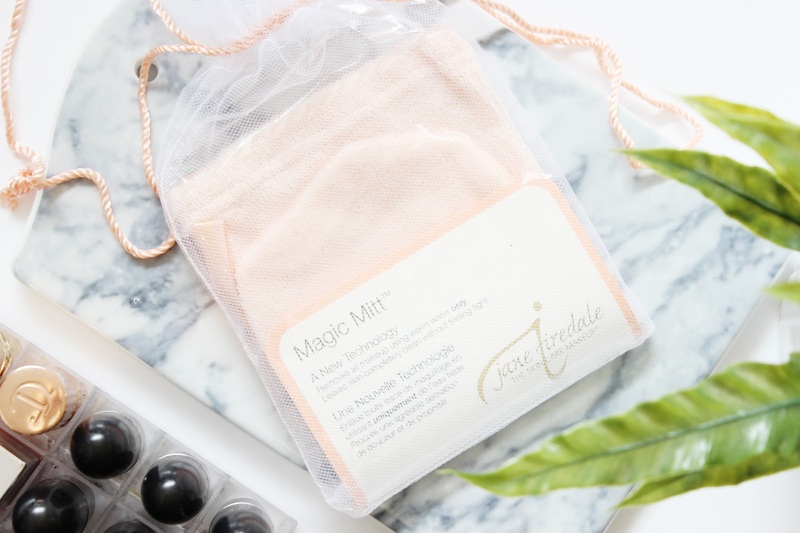 I've never been as skeptical about any beauty product that has landed on my doorstep quite like the Jane Iredale Magic Mitt* £17.00 - can cleansing really be this basic? But I can confirm the baby pink mitt is no glorified flannel, it really works. Softer and far silkier than your regular flannel all that is required is a little warm water - no separate cleanser! I pop the mitt onto my hand and gently massage the micro fibre mitt over my face and it removes foundation, eyeshadow and yes, even mascara without the use of a cleanser. But how?! According to Jane Iredale the combination of warm water and micro-fibres turn the makeup into an emulsion that is swept away by the mitt. And whilst it does take a little extra effort to remove lashings of mascara, I'm in awe at how effective this mitt really is. However, whilst Jane Iredale's Magic Mitt removes my makeup and daily grime leaving my skin feeling super soft, that fresh feeling just isn't delivered when using the mitt alone. But is that squeaky-clean feeling really any good for my skin? It's also worth noting the mitt does become a little grubby, but I've found a bar of Simple soap does the trick of removing any stains. Overall, the Jane Iredale Magic Mitt is a great alternative for anyone with dry, sensitive, or problematic skin that struggles to find a cleanser that isn't overly drying and irritating. Plus its a quick way to cleanse with no extra steps, or mess! Would you ditch your favourite face wash and try the Jane Iredale Magic Mitt?